Silver Thunder Alpacas welcomes you. Howdy. First of all, THANKS for visiting our website. We're Chuck and Nancy LaBresh and we're raising wonderful huacaya alpacas in the top corner of North Eastern Tennessee. We think that this area, called "Upper East Tennessee" by the old-timers, is one of the hidden gems among all the nice places to live in the good old USA. We like it so much we left sunny Southern California to come here. Sold our house, packed all our stuff into shipping containers, loaded the cats and whatever we could fit into two cars and a tiny trailer, and headed off across the country. Our alpacas followed separately via transporter. For more details on how and why we made this drastic jump, click on Our Story. We love our Alpacas and we think you will too. Just come by for a Ranch Visit and we'll introduce you so you can decide for yourself. You'll find that alpacas are people-friendly and easy to care for. They're great on small acreage, and alpacas are an attractive investment, too. Come and see. Pictured above is our ranch as it was just starting to take shape in early 2005. We spent several months buying land, building a house, preparing barns and pastures for the alpacas, meeting folks, and just learning about life here in Tennessee. To see pictures of the continuing progress, click on Ranch Photos. Jumping ahead four years to the present, we've now completed the house and continue to work on the barns, shelters and pastures. Here are current photos of the finished house, barns and of course, the alpacas, as of Spring, 2008. Across the top of this page (and every page on this site) are links that will give you lots of information about Alpacas. There's much to learn about these beautiful and inquisitive animals. Have fun looking around. 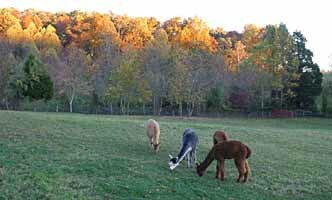 The Alpaca Financials page has great information on the investment value of alpacas. 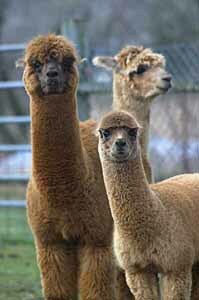 Coming soon in the third link will be detailed info on the evaluation of and uses for Alpaca Fiber. 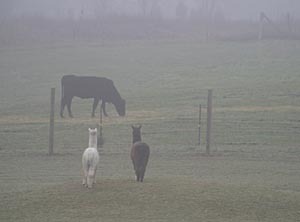 For handy and useful information on the care and feeding of alpacas, see the Alpaca Feeding link. The Alpaca Fun link will have goofy stuff about alpacas (as soon as I get it finished - ha, ha - by June, 08, really.) The last item on the list, Alpaca Friends, will give you links to other alpaca-related sites that are out there on the internet. Clicking on these will open them in a new window. Again, have fun looking! There's lots to learn about alpacas, and you'll have a blast doing it. Homegrown Tennessee Alpacas are waiting to meet you. 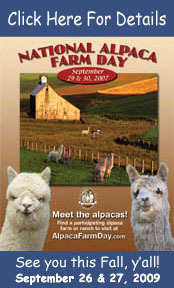 Come to Silver Thunder Alpacas and see them up close. 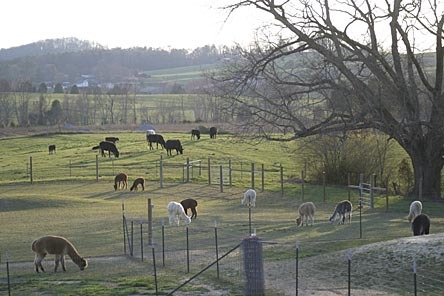 Alpacas, the ideal small-acreage livestock. Click here to return to the top of this page: Silver Thunder Home Page. Or just click on the Silver Thunder logo in the top left corner of any page on this site to return to the home page at any time.